details of the company, then I have no choice but to leave. Ning, and our sites, could disappear overnight, and with it years of content; a decade's worth in my case. I am responsible for the safety and wellbeing of my members, and this needs to be rectified right away. Things may be different in Russia than in the western world. But if you want to succeed worldwide—which you deserve to do, even with the bugs and slowish development—you're going to have to be open about the company. Please, let's get this handled now. In the past month, the nation has come face-to-face with an alarming epidemic among its youth: bullying, cyber bullying and teen suicide. As a platform that enables any person or organization to create a social website, we intrinsically understand the power of the social Web. It lets people gather around and connect directly with the organizations, artists, politicians, non-profit and brands that matter most to them. Anyone can instantly share, engage in a conversation, and connect with other people who share similar interests—to be social online. But just like in real life, bullying can happen online too. Reposted from The Ning Blog. As part of a series of educational videos about Hackers and Scams, I will be adding a new Video Episode each week, for the next month+ to the Creators site and JenSocial. Find out more about the report of all Scams - - Offline and Online. Find out if they are myth or fact. You can approve all new Members. This definitely helps in the prevention of Sign-Up spammers joining your Ning Network. You may not catch all of them, but most will give you good indicators that they are spammers. If you see repeated words like "i tell you later, i tell you later", or "i'm a good girl looking for love", etc... you can bet your bottom dollar, these are spammers. And of course goes without saying, Do not approve these accounts. Require new members to verify their email address - I advise turning on this feature for all Networks. An image containing words that users must correctly identify. I advise turning on this feature, due to most auto-spambots cannot enter a captcha correctly, since it is a never changing "image". Create a quiz question that new members must answer correctly to join. You can really get clever on the sign-up quiz question. I saw one where a Network Creator asked "Are you a real person?" and he set the default answer to "No". This will catch a lot of spambots, no doubt. Definition: A spambot is an automated computer program, or, more rarely, a script, designed to assist in the sending of spam - - and joining Networks for the same purpose in mind, including dropping links to illegal sites. Another great way to utilize this feature: add a question that only applies to your type network. Add a question that members of your site should know, if they are interested in joining your Network. A great example: A Ning Network for Golf may ask a question like this, "Would you rather have a Birdie or a Bogey?" I'm not sure what algorithm or criteria is in place for suspending suspected spammers. Please let us know your experience, if you know more about this feature. Perfect Example - - Just had this spammer join JenSocial (August 10, 2010), and about the 7th one today. BTW, I have not set a question for the Sign-Up Quiz yet. I will very soon! each year, which falls this year on April 15, 2010. " That's right! Tomorrow is the Day to Celebrate high fives, by indeed, giving out high fives as much as possible. 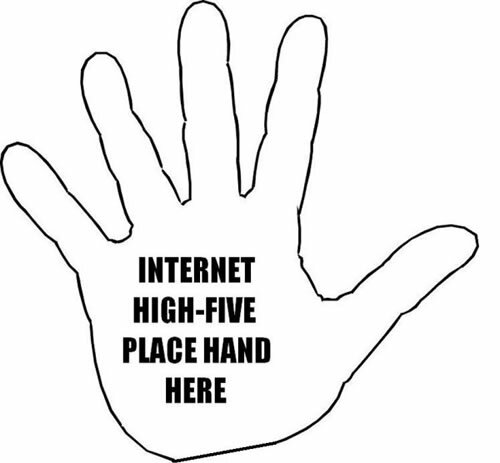 We're going to be offering virtual high fives here on Creators, to all of you who contribute positively to the conversations here. Check out more content (including videos!) at the National High Five Day website. A digest for Creators of discussions, blog posts, and interesting things found along the way in the past week — on Ning and across the Internet. If you haven’t seen it yet, we have a dedicated page where we’re posting updates on any spam-related issues. We released a new feature this week for NCs: Content Flagging. It’s entirely optional, and it allows you to give trusted members the power to hide content that is clearly inappropriate — like spam. You can read all about it here. Want to appoint some of your most trusted members as Content Flaggers? We've put together some boilerplate messaging language that we hope will help you reach out and invite them. Two of our SXSW contest winners report how you can really make a bang with very little cost but also how SXSW isn’t for the timid — or camera shy. What’s in Your Dream Text Editor? Thoughts on Community Management. One of the best general blog posts about tending an online space we’ve read in a long time. Superb. What to do after you lower the ban hammer: Replying to a Banned Member Who Wants to be Unbanned. Do People Really Need Your Online Community? This is an excellent reality check for a community that feels dead and needs reviving. Favorite quote: "If your community has died, don’t throw in the towel…. Sincerely reach out to each person with this question: ‘What would make you want to spend an hour a day in this community?’ "
Hey guys! So I was one of the lucky winners to spend some time with Ning down in Austin, and I just wanted to drop in to give some feedback from the perspective of Creators. This is aimed towards those who are interested in making money via your network, and feel ready to do that (big audience, big traffic, unique segment of a market). I know that's not everyone, but I feel like it'd be one major agenda that might drive you to consider going to SXSWi if you haven't been. Industry People: Austin is all about people. Everyone is there. Bloggers, Company Founders, marketing teams, PR people, advertising people, and thought leaders. There's lots of educational and non-profit conversations happening. If you wanted to meet them, hear from them, or pitch them (in a non-pitchy way), Austin is a great opportunity. I'd build a list of hopeful meetings, reach out beforehand to set a few coffee chats up, and then spend your time there using Foursquare/Gowalla/Twitter to track down the one's you don't have on your schedule. Feedback: The early adopter crowd is there in full force. They're willing to hear your ideas, your community dynamics, and your story. Literally everyone there has a story, and is open to share it in exchange for yours. There's no reason to be shy, because rather than criticize or shoot you down, you'll get valuable feedback and insight into what else is happening in your space. Promotions/Marketing: I was really underwhelmed at the 'buzz building' tactics in Austin this year, despite the opportunity. With 15,000 early adopters/open minded geeks walking around, all carrying with them an audience of interested parties, you can really make a bang with very little COST. It's more a matter of doing something really innovative. Perfect example: the Ning team hands out free pie slices during their 'office hours'...and they were not only gone in short time, but generated buzz that I heard for the next 24 hours at parties and via twitter. Parties: Parties are a big, big part of the agenda down there. Problem is that they're expensive and exclusive, generally. Thing is, the best ones happened off the radar. If you want to bring people together to talk about you or your community, do that in a social setting 'off campus'. I'm sure there's more, but that's a lot. If anyone has questions, just let me know...I'm happy to share! We Have a New CEO: Get to know our new CEO and let Gina know how much we appreciate her hard work by signing a virtual group card. Our 10,000 Strong Contest Rolls On: We crossed the 9,000 member mark this week, and we’re headed toward 10,000. We’re giving the lucky 10,000th member a Ning Timbuk2 bag and 10,000 Gift credits. If they mention you or your Ning Network, we’ll give you the same. More here. With so many new tools at their disposal, what did the attendees of SXSW use to communicate with each other? The Social Technologies Powering SXSW 2010 points them out. A lot of them are, not surprisingly, location-aware online tools. If Your Online Community Is in Trouble Turn to Grass for the Answer. No, it’s not about drugs, it’s an extended metaphor about gardening and people in online spaces. "Best of the Week" is a digest for Creators of discussions, blog posts, and interesting things found along the way in the past week — on Ning and across the Internet. Over the last 18 months, I’ve met many of you in person or online. For those I haven’t had a chance to meet, let me introduce myself — I'm Jason Rosenthal, and I'm honored and very excited to take on the role of CEO at Ning. When looking at the 2.3 million Ning Networks that have been created to date, I’m amazed at what you've all accomplished and inspired by your creativity. As CEO, you can expect to see us continue to rapidly innovate the Ning Platform, strive to provide you with the support you need when you need it, and to keep listening to and learning from all of you. I'd also like to take a moment to thank Gina for building Ning and infusing our employees and you, our Network Creators, with her passion and enthusiasm. Gina built an amazing team at Ning, and I am lucky to be working with some of the most talented people I've met in my career. I share Gina's vision for Ning as the place for people's interests and passions, and plan to continue to build on what she — and our team here — have already achieved. Thank you for making Ning what it is today, and I look forward to many more conversations with you in the future. PS: You can always get in touch with me here on Creators with feedback, ideas and suggestions. I look forward to hearing from you! Last day, and Mama's headin' out the door to an SXSW party (Get OUT. Reeeeeally??). Unlike last night and the night before, tonight should be a fairly early one (*snort*), seeing as my flight leaves at 8:30 tomorrow morn. What a fabulous experience this trip has been. I've been inspired, learned some new things, met some great people, made fantastic contacts (fingers crossed! ), and hopefully turned a bunch of people on to the awesomeness that is Ning. I'm SO grateful for such an amazing opportunity -- I have no question that with all I've gained these past few days, Swap Mamas will benefit immensely. I owe it all to you, Ning. I'll definitely be posting better pics when I get home ... catch y'all soon! Today was FANTASTIC. Great sessions, great parties, and now, at 11 pm, we're on our way BACK out to meld into the fray -- first on the list, the Mashable Party (if we can deal with the line wrapping around the block)! I'm spreading the Ning luv aaaalll around -- hoping to catch up with the RVIPers shortly. (Ning has an RV. They drive around. They let people on. And they SING KARAOKE. It's a beautiful thing.) One thing's clear -- EVERYONE knows what Ning is. And convincing them of it's awesomeness has been unnecessary. Best session today? Peter Shankman of HARO (Help A Reporter Out). If you're not already familiar with his site, do yourself a favor, head over and sign up for his 3x daily newsletter. His best advice? Be kind to people. When someone asks what my business model is, it's hard not to respond, "Be good to people and good things will come to you." It's how I live my life and it's how I run my network. Sadly, tomorrow's my last day ... I'm packing in as many panels as I can. As for photos? Of course, I have a bunch. But, um ... yeah, left the cord to download 'em at home. Lovely. Sooo, I promise to post as soon as I get back. For the time being, this crappy phone-photo should whet your appetite. SXSW Day 1+ (and I heart nerds). Day One at SXSW and seriously? I heart nerds. And I say that with all kind of luv, seeing as I'm a complete nerd myself. (Self-love is good, no?) Which means I'm in H-E-A-V-E-N. So far, best part of the day, was the Opening Speaker, Danah Boyd. Boyd works at Microsoft Research New England and also serves as a fellow at the Harvard University Berkman Center for Internet and Society. She's doing some fascinating stuff with regard to privacy and publicity. And one of her comments struck me as particularly relevant to many of the conversations going on in the Ning Creators Community. In a nutshell, she makes the very valid point (IMHO) that when it comes to social networks, more is not necessarily better. That just because we CAN "optimize" the user's experience, doesn't necessarily mean we SHOULD. I've often felt, that as much as I ADORE social media, it's important to remain grounded and remember that nothing replaces the human touch, metaphorical, or physical. Leaving just a little bit of that "human" experience in my network is integral to my network, and I would argue, ANY network. And when you can create a community that successfully straddles the chasm between the virtual world and reality? Gold. So, enough of the soapbox. Needless to say, I was impressed. And inspired. And later, when I attended the panel, "The Socially Conscious Geek: Making Money While Doing Good," I was inspired even more. Also called "The Social Media Scientist", Dan Zarrella shares boatloads of useful advice to help others achieve social media success. His latest blog post was as fascinating as the finding he published The Science of Retweets. In today's post, he states that articles published/shared on Facebook in the course of the weekend are shared A LOT MORE than articles posted in the course of the week. It kinda makes sense, if you come to think of it. Besides the reason Dan shares (that so many companies block Facebook to help with productivity), the weekend is also the time when we slow down, so we may catch up on the latest in the lives of our Facebook friends. Anyway... just thought I'd share this useful post with you all, in the wake of the recent update to our networks integrating them with Facebook more. Swap Mamas is about getting to know other parents, making connections, and doing a little old school trading with friends. The more you give, the more you get. Amped 4-a-Cure uses the universal language of music as the vehicle to deliver the message to the masses of the importance of getting behind the efforts of cancer research. 20 Something Bloggers has brought together thousands of bloggers from all over the world, and spawned a vibrant community of like-minded, fascinating people who thrive on one another's support and feedback. Stay tuned – we’ll be announcing another Creators contest this Monday - open to every member of Creators! What does that mean? "Social Media Week conferences take place simultaneously in multiple cities around the world. Tom Humbarger has written a fascinating read on the importance of active management to the success of an online community.One of the most interesting sections to me is the Google Analytics snippet. We don't often get to compare our network metrics to others. In a year and a half, the group grew from 0 to 4,000 members, and in the final full year saw just under 200,000 pageviews. Happy CMAD!If you didn't know today is Community Manager Appreciation Day, it's ok. It doesn't mean your community doesn't appreciate you. They likely don't read or follow Jeremiah Owyang, who has dubbed the fourth Friday in January, Community Manager Appreciation Day. Manny Hernandez, Network Creator and Guide here on Creators, is up for a ShortyAward for his network, Tudiabetes. Shorty Awards honor the best producers of real-time, short form content on Twitter.Let's help out a fellow Network Creator and vote! Tudiabetes, a "community of people touched by diabetes", is currently in 4th position in the health category. To vote, just tweet:I nominate @tudiabetes for a Shorty Award in #health because...(add reason here)Visit Tudiabetes.org to see the amazing work Manny has done so far then add your reason in the tweet. You can do this on Twitter.com, with any Twitter client, or using the voting box on Shortyawards.com.